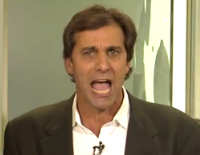 Even though the one and only Chris “Mad Dog” Russo is grounded in New York, that doesn’t mean he ignores the Bucs. One reason Russo keeps up with news from Tampa is that his oldest son goes to school in the area. 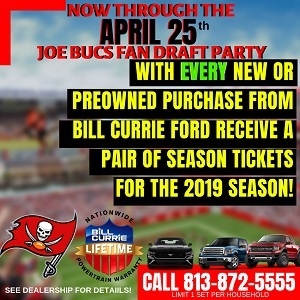 Another reason is that his good friend and internationally popular JoeBucsFan.com columnist Ira Kaufman appears on his SiriusXM Radio show weekly on Wednesdays during the football season. Russo, even when talking to Joe at the Super Bowl last year, is no fan of Bucs defensive tackle Gerald McCoy. In fact, Russo believes part of the reason the Bucs have struggled defensively is because of GMC. In the past two weeks, Russo has had choice words for GMC when Ira has appeared on his show. Russo believes there is a direct link between the defense sucking eggs and GMC not making any splash plays, in Russo’s eyes. Two weeks ago after the Bucs bungled a game away to the Bengals, Russo dove in on GMC to Ira, his voice dripping with sarcasm. Russo has a memory like an elephant. And when the Bucs defense dropped an elephant-sized load on the field at Carolina last week, Russo was armed and ready for Ira about GMC days later. “Enough of Gerald McCoy. Enough now,” Russo said. “I don’t want to hear another word from you about how he’s an All-Pro, he’s going to the Hall of Fame. This nonsense I’ve heard about Gerald McCoy from you for about five years about how he’s the best defensive tackle that nobody’s heard of. There is no question GMC is having a rough year. And it looks really bad the way people screamed for years that if only GMC had a decent edge rush it would turn him loose. Well, now the Bucs have one with Jason Pierre-Paul and GMC is virtually invisible. That’s not a good look. Yeah, he has two sacks but you have to think hard and surf Pro-Football-Reference.com to remember those plays. The whole defense, with the exception of JPP and Vinny Curry, is having a rotten year. For GMC, it’s terrible timing just when the Bucs finally find an edge rush. I am SHOCKED there aren’t 100+ comments in agreement on Russo’s take already on this entry. You just must have JUST posted it. We have been saying it for…UMMMM….5 years as well? NOW watch him go out and get a sack in garbage time tomorrow. Do we have the transcript for the esteemed Ira Kaufman’s rebuttal? Helluva point to argue. Paying so much money for a rotten D.
GMC is definitely overrated. Russo is right in that he’s not a game changer. He’s always been a one trick pony. Very quick off the snap. That’s it. It makes for about ten good plays a year. He was most impactful when playing next to Bennett. That was a long time ago. Don’t think he’ll be a Buc much longer. The thing is you (Joe) are says he’s been struggling this year but this is the exact same performance he has done every year. He never actually makes a play, gets off the ball quickly creating a natural hole in the defense and then he gets hurt. This is the same pattern year after year. This is not a new occurrence as it is the same story year after year. He’s just overrated. He’s been overrated his whole career. Citing coaches as people who heap praise on him is silly, what are they gonna do dump on the guy? He’s a decent DT, and a super nice guy that people like. Thats it. He’s not a special player and never has been. And it’s specualtion but I firmly believe he contributes to this losing culture and “Ho-hum” attitude of the defense. Not sure his contract status, but he makes little to no impact and I’m trading him next year if possible. Time to cleanse the defense. Lavonte is on this list as well. And JPP doing EVERYTHING by himself now should convince all the other blind GMC loyalists that he is overrated…. If he had been drafted anywhere but the first round he would have never gotten that contract and would have been released years ago. He’s basically held this team hostage for years from switching to a more aggressive front 7 look and scheme. HOF??? Give me a break. He’s been part of what, three .500 or better seasons in his career? Two years after he’s gone nobody will remember him, unless we’re reminiscing about some of the more overrated players in Bucs history. They should have drafted Aaron Donald and traded GMC 5 years ago. But, why cry over spill milk? Finally the national media is taking notice, he’s been a fraud from day one. He became a star in Tampa because we had no one else to label as our super star. For years the GMC apologists have stood by the “GMC doesn’t have any help” argument. Ok JPP is having the best season by a DE since Simeon Rice played, even Nassib has shown on the other side. Where is GMC? Dancing on the sideline in a loss. Have his numbers been better with this new help on the d line? No, his numbers are down. Face it, we didn’t look any worse on defense when he was out, so why spend all that money on the face of the worst defense in franchise history. Well said Bradentuckey. I’m not sure we could even get a fourth round pick for him. I’m sure his quick step will be very useful when he goes running to his mommy and daddy after being shown the door in Tampa. Do we have a starting QB? How did our team become the absolute joke of the NFL and depleted of any talent ? A) I think both sacks Carmen off stunts. B) I just haven’t seen the same Vinny Curry as you. GMc’s first sack this year was on a stunt and the second was in garbage time. He just never makes an impact. Ever. Russo is right. How do you say “crying like a little girl” in Hawaiian? If you didn’t know this was going to be GMC’s worst year as a pro, you just haven’t been paying attention. McCoy, in the past, absolutely was 100 percent a very, very good, not great, pass rushing 3-tech. But since turning 28, his production and number of explosive QB pressures/hits have been declining sharply. I’m not a McCoy hater but I wanted to trade him and throw a crap ton of money at Kawann Short. And then once Short had been signed I wanted us to go out and sign Sheldon Richardson and Dontari Poe. actually still in shock that joe would even post such blasphemy about his favorite underachieving man crush…. Itll be another 10 years before this can compete just to win its division….they’re sorry asf! I’m am bleeping tired of talking about mediocre players and trash players. Gerald McCoy is average and has been for a while and that’s cool. Only Tampa media makes him relevant. He’s not top 5 in his position across the league and yet. He’s not HOF material and he’s been the face of trash defense! So is Russo the true identity of tmax? It just amazes me how so many people would make excuses for McCoy. He’s double teamed, he needs help from the DE’s, the coaches don’t utilize him right, he plays hurt all the time which effects his play. He may of been above average at one time in his career but that’s about it. The dancing, crying, camera finding DT of the Buc’s is way over rated. It’s about time this comic book charicarure has been exposed. The fans that do their homework and don’t believe this “been elected by his peers and fans to such such many pro bowls “ have been saying this guy is a clown and way overrated for a LONG time! Cut this bloated fake whiny little beeetch! I just don’t get the fanfare that supports GMC. – they said he was a leader on the defense contrary to criticism suggesting his friendly demeanor had no use in a defensive huddle. Now he has been stripped of his C, as teammates instead gave it to Kwon, a guy with fire. – they said, at the least, his get-off was unstoppable. They defend his play with 8 sacks/yr and a pro bowl spot. Yet back on the home front, those that watch his play with a critical eye, see sacks coming in garbage for a defense that consistently ranks at the bottom of the league. I understand what he brings to the game, but over a decade, I just don’t know what he brings to this team. I believe part of the Bucs being so poor since Chucky, is due to a culture of losing. Who has been with this team since 2008, during all that losing? And you’re right Joe, now he has help on the edges and his performance has actually dropped off. Trade him, what do we really have to lose? GMC stinks. Nuff said. A waste of 3rd overall pick. Terrible timing? Are you still trying to get your Rocky Road lover Geraldine McBooty off the hook? Are you insinuating that the YUCS took too long to get a DE and now McBooty’s best years are behind him. Is that why you think he’s not producing? Maaaaaaaan! I’ve told everyone for years now that he’s garbage. Especially when all you MF’s claimed he was quadruple teamed every play. And don’t get me started with the oh, “he made the pro bowl $$hiit”. For the record, all ya except for the haters are slooooow af. Just for perspective not only has Ira talked about GMC and the HOF but just this summer he was trying to prop up Dotson too. Smh lol. Not sure if you’re just straight up lying to readers or if you’re trying to be supportive of the org but nevertheless it kills your credibility. Joe tried to prop up the oline and Barber. Lol. Everyone said DJax was a weapon even though I tried to tell ya last year he’s lazy af and is all about me. Even told ya from day 1 that Smith is soft af and moonlights at Hamburger marys. Suh is better yet on his 3rd team now. Tampa continues to pay him a premium salary when he’s worth about 1/3 or 1/4 of what he gets. Throw in the “sorry, Ben” stuff and an angry fan base is going to go after him. This will be his final year as a Buc ( hopefully ). He’s the best looking DT in all of the NFL (in the training room). Unless Gmc has a major comeback of 6 sacks and a mess of tackles , change is inevitable. The real question is who will manage the upheaval this team is facing in personnel and coaching staff. No more same old same old from Jason Licht .The Architect of this mess has to go. I will not rest until Cancer 93 is gone or traded. More of Russo and less of apologists!!!! Lavonte is having another great year, just sad he plays on such a bad defense.